We were having a stroll around the Marais area of Paris, where we were staying, and we were confronted with a reminder of the security situation after the events of a year or so before (Bataclan). We'd seen the heavily armed cops on the streets a few times but hadn't seen a squad of heavily armed French marines doing that urban patrol thing before. A couple of intimidating guys in camo and balaclavas either side of the street ready for, I guess, anything. The last time we were here it was cops on rollerblades. This time round most of the city's landmarks had heavily armed soldiers guarding them. I had people ask me why we were going to Paris because they believed it wasn't safe. To be honest the thought never crossed my mind. Paris is as safe as anywhere in my opinion. The level of armed security only reinforced that. Would I take my kids there? Oh hang on. We did. Oops. Other than that Paris was as vibrant and lively as ever. If anything there are more people around that there was the last time we were here 10 years ago. Oh, and the coffee is better when you know where to get it. Speaking of which we made our daily pilgrimage to Fondation for coffee and lamingtons. But a lamington does not a breakfast make. We didn't want to trek all the way over to HolyBelly and Du Pain des Idées so we tried to find somewhere local. It was late most so breakfasty type stuff was finished for the day so we hoped to get something brunchy. After that Notre Dame was calling. Notre Dame may have been calling but the call of the fromage was louder. A cheesey brunch is should be a necessary start of any day of country whose very foundations are laid on giant wheels of brie. 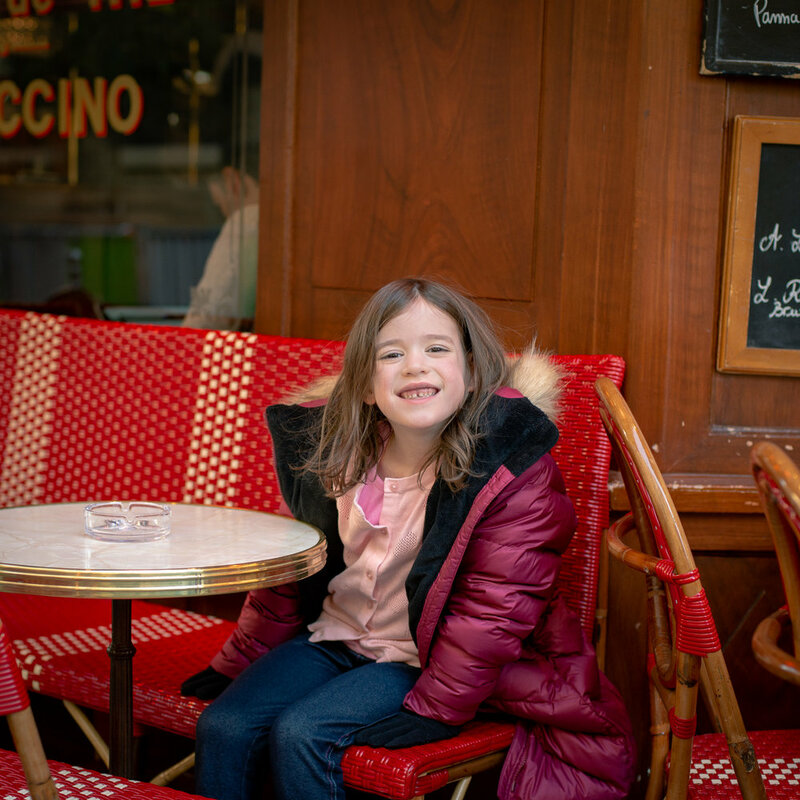 We found a traditional Parisian cafe, Camille, with the white aproned waiters and the promise of grand platters of fromage. Throw in a couple of baguettes, an omelette and a cappuccino, the less said about the cap the better, it was a pretty good brunch. Not horribly priced by Parisian standards. A good way to energise to answer the call of Notre Dame. We still need some ski gear so we checked out a shop selling ski gear right out of the 70s. Apparently when we hit the slopes later in this trip we were going to be downright unfashionable if these costumes were a guide. The price was right out of 2016 though. 700-ish euros for one outfit was about 650 euros over my budget. For the whole family. But, yeah, if I was Austin Powers I could would so rock these outfits. By the time we got down to the Seine the temperature had soared to high single digits and the sun was shining brightly. Jackets were unzipped and discarded. The Seine sparkled. No sign of huge river rats I've seen before but plenty of swans, river chickens, begging for scraps. Not a bad spot down below Notre Dame for a photo op. We've been inside Notre Dame before so we had no pressing need to inflict it on the kids. They were having enough fun running around in the sunlight to go inside a cold dark church. Albeit a spectacularly beautiful interior. Don't let me put you off going inside if you've never been. It is totally worth a visit. However, for us on this visit, it was enough for us to take in the soaring buttresses and gargoyles from the outside. We had five countries choc full of churches to come. I was pretty sure we'd end up in one or two at some point. We still had a couple of hours daylight left so we decided to visit the Tower again. Maybe get some family snaps from the iconic locations. The Metro was the quickest and easiest way to get to the Tower. The Metro station we exited was quite near the Aussie Embassy. Seriously, they must have one of best locations for an embassy anywhere in the world. I wonder how they snagged it? I wonder how much we tax payers are paying for it? I wonder how you'd score an office with a view of the tower? I wonder how I could get an embassy job? Lots of questions. I wonder if there is a tool that could help answer them? I should Google that. At least we'd arrived earlier than the day before so we had enough time for some Instagrammy photos. It isn't bad sitting on the steps of the Trocadero eating popcorn and watching the hawkers try to flog their dodgy toys and souvenirs. We'd hoped to be nearby for when the light show started but apparently that wouldn't be till later and it got cold and dark quick. We thought if we went and had a hot chocolate and a crepe at a nearby bistro, Le Champ De Mars, maybe the light show would've started by the time we finished. The lights were on but nobody was flicking switches. At least we had crepe. We hadn't seen enough Uni-Glo stores on this trip so we thought we'd check out another. This one was a short taxi ride, about 2 kays, from the tower to the shopping centre. The thing you take from this that late November in Paris can be unseasonably cold. We thought we prepped for Winter in Europe, and we were if it snowed, but for in between stuff when you're out and about in town we just didn't have enough layers. The crepe had worn off so dinner was the next thing on the agenda. Uni-Glo is over in the 15th Arrondissement of Paris. It would be sensible to eat there or closer to home in the 4th. So we so split the difference and went to Chez Michel in the 10th. It was sort of on the way home by taxi. Sort of. Dinner was another tired affair. The kids barely ate. Thanks to the jet lag that seemed to be hanging around for days they were stuffed from doing not very much at all. We had snails. Chez Michel was pretty good and not too expensive. Actually quite reasonable. I am fairly certain we chose it because it is listed in the Michelin Guide as a Bib Gourmand restaurant. Good cooking at a reasonable price. And it was. It was something like three courses for 35 euros. I bet the other customers didn't expect to be entertained by a 3 year old falling off his chair when he went to sleep at the table though. There was a nice big thump as he hit the deck. And that was our brief Parisian sojourn. The next day were flying to Madrid. That's in another country. You can't go there by bus. Actually you could but it is fractionally quicker to fly. We drove from Paris to Madrid once and that took us about 6 weeks. I wasn't going to risk us getting lost in Provence again so we flew. Here's a couple of things we learned about Paris. By learned I mean we knew from the last time we were there but this visit just confirmed. The French aren't rude or unfriendly. If you constantly come up against "rude" French people I suggest you should probably reassess your approach. Snooty French waiters are also a myth. Maybe that snootiness you encounter is just polite reserve wrapped up in formal service. We want to go back to Paris again. This visit wasn't entirely successful. The flight delays really stuffed our circadian rhythms and the kids especially suffered from jet lag for days. So until next Paris, je t'aime et au revoir.